So no matter how frustrated I might be at the plain-ness of my outfits or such, I need to learn day by day to coordinate and to know what does look good together (for both my taste and gal, that is) with what I have and what can be a "profitable purchase". That said, I wanted to make a list of stuff that is fashionable nowadays which I like so I could have a clear guide when January (and its dear sales lol) comes. But first I'd like to review of some of my old outfits (of the few ones I've got pics) and my evolution through time so I can share a starting point and have all your advice to begin with. 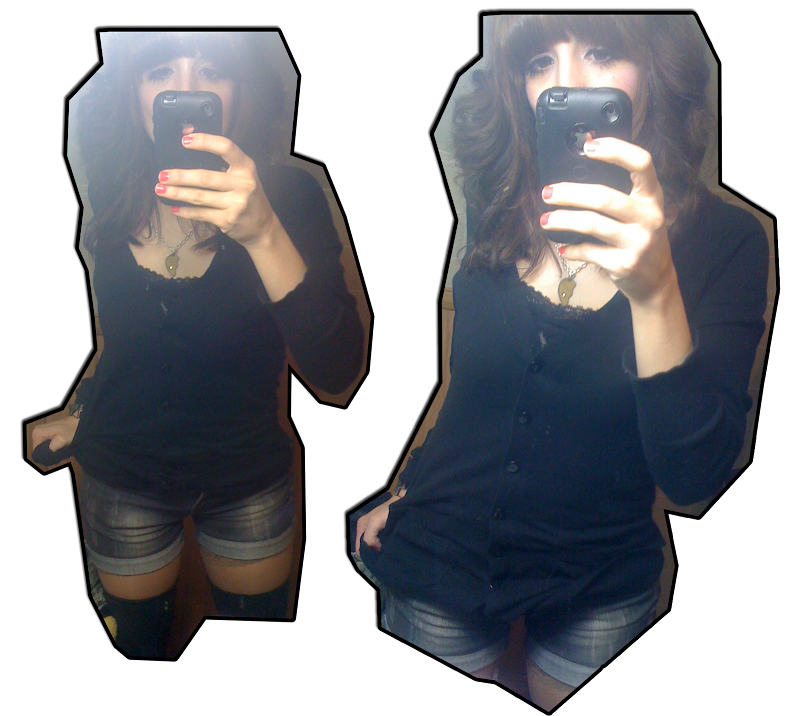 Of course I've got to say that I despise every single pic and attempt of outfit, lol. I'm just a noob and I can see the difference between those who really got the style in their hands and dominate it and make it look so easy! (Hallo you! :P). 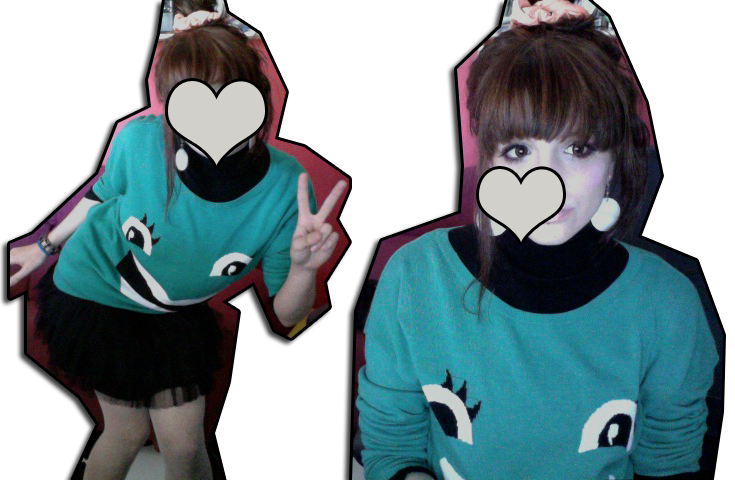 Also, I'm in a "I want to burn my whole closet" mood, but I'm trying my best haha. 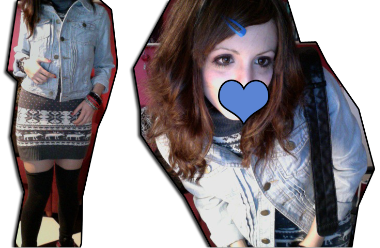 This is the oldest attempt of outfit which I keep pics of in my computer after changing my hair color and trying some new stuff. Here I was combining two skirts to get something more catchy(? ), and a hair accessory. I don't really like how plain the sweater looks, and I believe it'd be better just changing it with a less "boring" one. Details like any kind of cute print or bows or whatever would have done. Of course, same applies for the cardi, but I really don't think that's the problem. Hair: I'd like it bigger. 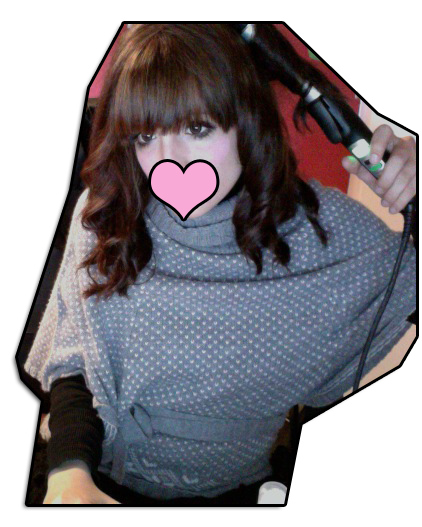 I didn't have a hair curler back then, so I tried my best just with the dryer. I think it looks somewhat cute, but not big and noticeable enough. I was somewhat more focused on make up back then. Also, maybe if the tights would have had a larger hole of net or more details it would have looked way better. More interesting for the eye. And finally: ACCESSORIES! A bigger belt (with chains! like that d.i.a. belt with a star which omg I just love!) and necklaces! When I found that smiling sweater in H&M I fell in love with it. I found it funny and trendy and whatever. Now I kinda hate it and it's been a bit less than a month, lol. What would I say here? I don't really like how anything looks. Maybe tight-high socks would have everything look way better instead of those lacey white tights that just make my legs look like columns lol. Necklaces are one of my constant points of failure, and I wasn't wearing bracelets either in that pic, so this adds to the plainless. Maybe some huge white furry earmuffs would have made everything look better! I don't really know what else can I say here. I'm sorry, but I don't have a full body shot of this. I wanted to put it here because it's one of my first attempts to style my hair with the teaser! I love that nordic print "poncho" thingy. This is one of the pieces I'd save and it's a pity I don't have a full body shot of a coordi! I'll try to make one soon. No real highlight on the outfit here, even if I'm choosing this pic. I'd posted it because this was one of the first time that I liked how much volume did my hair end up with! 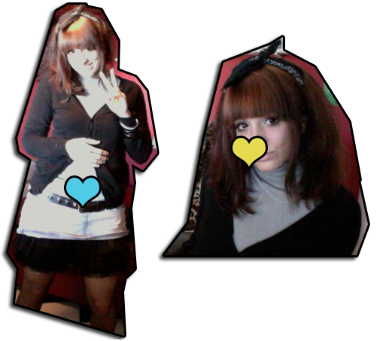 Same boring grey sweater, and a jean skirt which I ended up boring, but the outfit was incomplete by the time I took that pic! This is one of the first outfits that I start to like. It's simple, clean and it has two three of my favourite things: nordic print, tight-high socks and jean! I do look a bit chubby in this pic though, wouldn't know why. I'm aware of it lol. Anyway, it still lacks some accessories, like furry things, and better shoes. I wouldn't know if adding a belt here would be a good or a bad idea. And finally, this would be my fav choice of all. I really like the tights, I really like the skirt and how do the knee-high socks and the boots look like together. I wore this with my (ridiculously short) H&M fauxtail (see the word game I did there? XDDDD), which is an accessory I love. As always, something for the head and a belt would have made it all look better. And a necklace! Of course, I'm nothing near good but my point is to keep trying and improving a lil bit with each try. I'm a bit sad because I wore some outfits which I might have liked a lot, but I can't find appropriate pics (not good quality enough) or no pics at all. To the left there's an example of poor quality pic. From this small analysis I've seen that I repeat a lot necklace, belt and hair accessory (and earmuffs! ), (and shoes, and nails, but that's a whole different story) so these will be my targets (aside from blondness lol) for my next magazine dissection and shopping spree! ¡Suerte con tu gyaruconversión! Aprovecha ahora que viene Navidad y pide muuuuucha mucha ropa XD (Como hago yo X3)! Soy Nana, encantada de conocerte y de visitar tu blog ^_^ Te sigo, un besote! Me encanta tu blog! I tus outfits!!!! One chan!!! Tu como siempre de mejor en mejor!!! Sigue asi, quizas se me pege algo de ti! que de outfits!!! Me ha encantado esta entrada!! me gustan mucho sobretodo el ultimo , penultimo y el de las medias rajadas!! El colorete que uso si que es naranjita, de una marca random, me costó unos 3€ y estoy encantada :) Uso más el colorete naranja que el rosa. Love this post you have such great style!! The third is one of my favourites out of these but still they are all amazing! !